Sitting on a wide-open square just next to the city center, The National Assembly serves as the seat the country's political activity and is considered one of the icons of the capital. Completed in 1938, this Neo-Renaissance and Neo-Baroque building took 30 years to reach its final form due to the two Balkan Wars, World War I, and the Great Depression of 1929. Observe the monumental facade with mighty pillars and massive horse statues in front, and visit the interior of the building. Take a tour to see frescoes from 1937, renowned sculptures, and exquisite furniture. Although heavily damaged and looted during the civil riots in 2000, the structure ranks as one of the city's most attractive monuments. 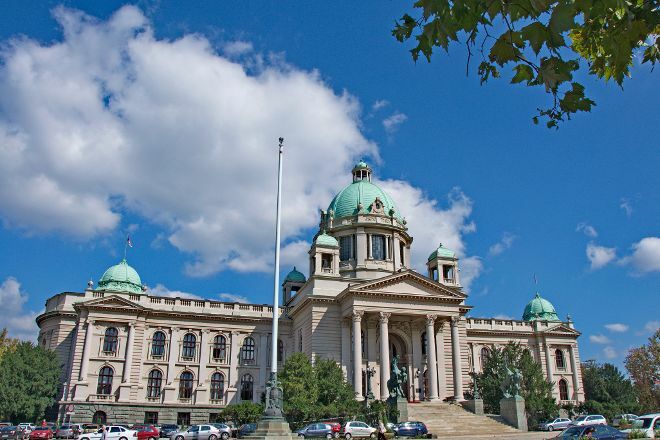 See The National Assembly and all Belgrade has to offer by arranging your trip with our Belgrade online day trip planner . I just came across this very important Palace numerous times, and every time I felt the need to stop for a moment and admire it in all its beauty. I'm sorry I didn't never entered to see the Interior, in fact I was always just passing through to get to (quickly) somewhere else in Belgrade. On the other hand, walked across the small park in front of the building: it was very nice. At night, then the whole building is illuminated in a very suggestive, highlighting the white on black of the night. King Peter I built the House of Representatives of the Kingdom of Serbianear the former location of a large Batal mosque. The first plans for the future House of Representatives were drawn up by architect Konstantin Jovanović in 1891. His plans were slightly revised because of a new state constitution mandating a bicameral (instead of unicameral) legislature. The 13,800-square-meter building is designed in neo-baroque style. Its interior, completed in 1938, was designed by Russian architect Nikolai Krasnov. Krasnov designed every detail: chandeliers, lamps, handles, windows, and furniture. His plans were painted in watercolor, rather than a classical technical drawing with pencil and ruler. This is a very beautiful building with two amazing statues in front of it. It is a great place to spend some time and take a few pictures. However, I guess you cannot get in the building! House of the National Assembly of the Republic of Serbia, one of the Belgrade landmarks. The building is on Nikola Pasic Square, in downtown Belgrade and looks at Pionirski park and Belgrade City Hall right across the road. Very beautiful during Christmas season. Covered in Christmas lights, it's quite a sight for great picture taking. I couldn't go in, but the good stuff is on the outside. Bring your camera in December. 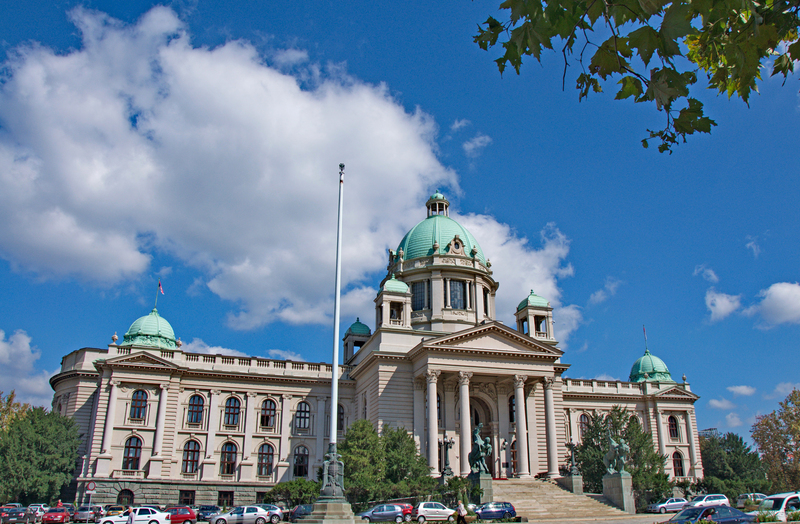 One of the most prominent buildings in Belgrade erected in 1936, the country's Parliament. It is an impressive piece of architecture that lies in the vicinity of the Republic Square - Belgrade's main square. It is a must see sight in Belgrade. Pay attention to the horse and giants statues in front of it. Statues have a symbolic meaning. Horses represent strength and humans control and tame the horse's strength - much like the Parliament rules the country. Every day, we help thousands of travelers plan great vacations. Here are some tips on how to use your Listing Page to attract more travelers to your business - The National Assembly. Promote your permanent link - https://www.inspirock.com/serbia/belgrade/the-national-assembly-a520925461 - on your website, your blog, and social media. When a traveler builds a plan from this page, the itinerary automatically includes The National Assembly. This is a great way for travelers looking for a great vacation in your city or country to also experience The National Assembly. Promoting your link also lets your audience know that you are featured on a rapidly growing travel site. In addition, the more this page is used, the more we will promote The National Assembly to other Inspirock users. For best results, use the customized Trip Planning Widget for The National Assembly on your website. It has all the advantages mentioned above, plus users to your site can conveniently access it directly on your site. Visitors to your site will appreciate you offering them help with planning their vacation. Setting this up takes just a few minutes - Click here for instructions.